Clements Ribeiro goes for round two with Evans this fall, bringing lady like sophistication combined with a hint of rocker edge. As I am not typically a fan or consumer of the regular Evans clothes, but I am a fan of the Clement Ribeiro for Evans. Reason being it's just that the regular clothes rarely tickle my fancy, but this designer line does. I tried out some pieces from the first collection that launched last spring. I loved the last collection, but I will say that it was hard to wear for someone with my body type. The last collection was a boxier cut, so it was great was rectangles, apples, and inverted triangle body shapes. If you are extremely curvy, like I am, it was harder fit. I stuck to picking up the tops and a jacket. 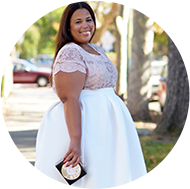 I do have my eye on that lace pencil skirt, which I feel will probably work because the alteration will be simple as I will just get the waist taken in. What do you think of the link and what do you have your eye on? OMG this collection is even better than the previous one, I love everything! But I´ll have to wait until it get´s on sale.... I love that cardi but it´s quite expensive! I think a lot of people will be waiting for it to go on sale LOL. Last time I cleaned up! Hey Chastity! I love your style but Im not feeling this collection at all. I think it may be one of those cases where I would have to see the clothes on you. I know you can rock anything, but I guess this just isnt my style. You are always chic! Hi Brandie, It's definitely different. I wouldn't wear how they pictured I would mix it into my current wardrobe, but this collection is on the side of fashion forward and not what you consider to have commercial appeal (in my opinion)so I can understand why it's not overly appealing. The first time I saw it, I was like huh, but it grew on me quickly once I started to think of the pieces separately. I hated the last collection but I want every piece you posted in this collection! I cannot wait until the Mimosa Print pants and top go on sale! That first outfit made my heart skip a beat. That pattern! That metallic blouse is making me crazy. I need it! And I thought the first pants/top was a jumpsuit but I kind of dig it being seprates. Are you getting the pencil skirt?